The Falcon program is a joint venture by the Defense Advanced Research Projects Agency (DARPA) and U.S. Air Force. The program's objectives are to develop and demonstrate hypersonic technologies that will enable prompt global reach missions. The future vision for this capability entails a reusable Hypersonic Cruise Vehicle (HCV) that could deliver 12,000 pounds of payload at a distance of 9,000 nautical miles from the continental United States in less than two hours. The Falcon program will develop and demonstrate the technologies that will be required by a HCV: high lift-to-drag aerodynamics; high-speed, turbine-based combined cycle propulsion; high-temperature materials; thermal protection systems; and advanced guidance, navigation, and control. The Falcon program will address the implications of hypersonic flight and reusability using a series of hypersonic technology vehicles (HTVs) to incrementally demonstrate these required technologies in flight. An MOA with the Air Force in FY 2007 established the HTV-3X Blackswift Test Bed program. Given the importance of this activity, the HTV-3X Blackswift Test Bed has been separately budgeted in FY 2008. 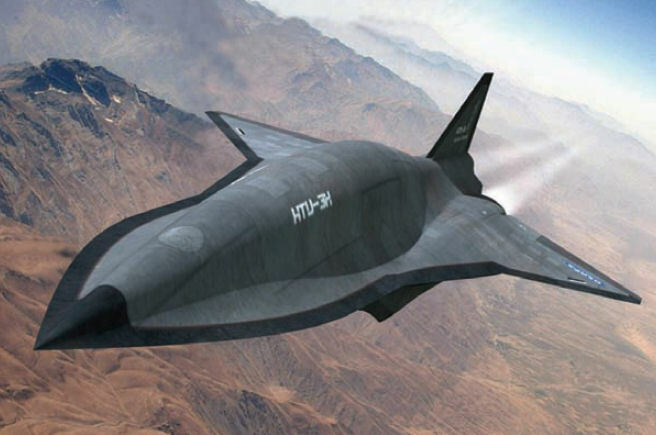 DARPA and the Air Force planned to leverage work begun under Falcon HTV for the HTV-3X Blackswift Test Bed, which would have demonstrated key hypersonic cruise vehicle technologies in a realistic flight environment by means of a reusable hypersonic aircraft test bed able to takeoff from a conventional runway under turbojet power, accelerate to Mach 6 speed under combined turbojet and scramjet propulsion, and land back on a runway. 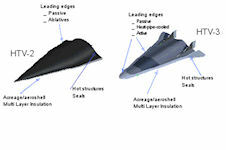 Revolutionary Approach To Time Critical Long Range Strike (RATTLRS) is a Navy, Air Force, NASA, and OSD interagency cooperative program, to develop a high speed non-after burning turbine, Mach 3 flight demonstration program for a future expendable high speed strike weapon, while also enabling potentially new options for access to space. The Air Force Research Laboratory (AFRL) and DARPA transitioned the RATTLRS core engine to further developmentfor the joint HiSTED (High-Speed Turbine Engine Demonstration) program, with plans to groundtest the engine near Mach 4 flight conditions in 2008. The DARPA/USAF Falcon HTV-3X Blackswift Program is developing a turbine based combined cycle (turbojet/dual-mode scramjet) propulsion testbed. The Falcon program plans to use RATTLRS core engine for its turbine accelerator, as well as RATTLRS airframe fuselage and control surface manufacturing techniques. The third, and final, Falcon HTV, initially slated for flight in 2009, was to be a departure from the previous two demonstrations. The reusable hypersonic glider will lift off from NASA's Wallops Flight Facility, Wallops Island, Va., and then over an hour later, be recovered in the Atlantic Ocean. In addition, the HTV-3, flying at a maximum of Mach 10 speed, will be designed to achieve high aerodynamic efficiency and to validate external heat barrier panels that will be reusable. The HTVs will prove technologies for global reach vehicles that can get a payload to the area of interest quickly in support of the joint warfighter. The Falcon program had planned to develop a third Hypersonic Technology Vehicle (HTV-3) that would focus on reusable materials. Propulsion advances under the Falcon Combined Cycle Engine Technology program (FaCET) led to the decision to evolve HTV-3 into a Test Bed that will take off from a conventional runway, cruise at Mach 6, and land back on a runway. The test bed's nickname become Blackswift. Blackswift would have demonstrated key technologies such as efficient aerodynamic shaping for high lift to drag, lightweight and durable (reusable) high-temperature materials and thermal management techniques including active cooling, autonomous flight control, and turbine-based combined cycle propulsion. Flying this hypersonic test bed in a relevant flight environment would have permitted the future development of enhanced-capability reusable high-speed vehicles for intelligence, surveillance, reconnaissance, strike or other critical national missions. The Blackswift Test Bed would have used an air-breathing propulsion system consisting of a turbine based combined cycle (TBCC) engine. Propulsion from take-off through supersonic flight regimes and landing would have been provided by turbojet engines. Propulsion for high supersonic and hypersonic flight regimes would have been provided by a scramjet engine (a capability referred to as a dual mode ramjet engine). The engine technologies are being developed under the DARPA High Speed Turbojet Engine Development (HiSTED) program for the high-performance turbojet and under the Falcon Combined Cycle Engine Technology (FaCET) for the scramjet, and these programs are continuing. Congress made significant reductions in the amount of FY 2009 funds available to DARPA and the Air Force for the Blackswift Test Bed, and based on this, DARPA determined that the effort would not proceed. The DARPA/Air Force Falcon program continues to proceed with fabrication of the Hypersonic Technology Vehicles, and intended to conduct two flight tests starting in 2009.